Venom Prison have been lifting up the barriers of extreme metal and dismissively throwing them a further 50 yards down the road for some time now. New album Samsara sees them hit the kind of peaks that a Himalayan guide would be proud to reach as the Cardiff crew smash their way through 10 tumultuous tracks. Russian born Larissa Stupor has developed into an astonishing vocalist with a sinew stretching delivery that is at times bordering feral. The anger and vitriol and sense of injustice shines through with everything Venom Prison do with the politics of female exploitation and abuse the driver behind many of the tracks on the new album. While 2016 release Animus was the kind of debut that would stop anyone in their tracks, and led to the band receiving the Metal Hammer Golden Gods award for best new band in 2017, Venom Prison have now honed their art to even more dangerous levels of intensity, pinning you to the floor immediately with opening firestorm ‘Matriphagy’. The album title references Samsara, the Buddhist concept of being reborn through life and suffering and there’s no shortage of the latter here with Larissa seemingly on a one-woman mission to address as many societal ills and personal challenges as is possible to realistically do within the confines of one album. This album also marks the arrival of new drummer Joe Bills and his hands must be coated in bandages following their rough treatment he has dished out on this album. 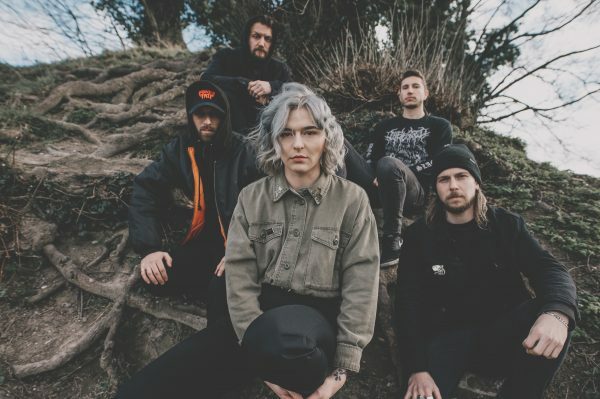 But while the brutality leaves you beaten and bruised, the dual guitar attack courtesy of Ash Gray and Ben Thomas means the carnage inflicted on tracks such as the savage ‘Uterine Industrialisation’ is as rhythmic as it is riotous. After four thumping tracks that leave you nursing bruises like a well beaten boxer, the murky instrumental ‘Deva’s Enemy’ allows time for at least some wounds to heal before the punishment is ratcheted up once more on the monstrous ‘Asura’s Realm’ with Larissa at one point bellowing “Revolt, Resist, Destroy the rich” in the style of 1980s’ anarcho giants Conflict or their even more visceral predecessors Crass. While Venom Prison’s trajectory soars inexorably upwards reflected by the wave of journals with Larissa on the cover, there is not a hint of suggestion that the Welsh crushing crew are in any way playing for the gallery. There’s certainly nothing populist about such razored incisions as ‘Implementing The Metaphysics Of Morals’ or the album’s juggernaunt stomp sign-off ‘Naraka’. Produced by Tom Dring, Samsara is the kind of album that is likely to keep Venom Prison busy on the road for a couple of years. Luckily for those in this part of the world we won’t have to wait too long as they check into Mama Roux’s in Birmingham on May 29 alongside headliners Fit For An Autopsy, Vulvodynia and Justice For The Damned.